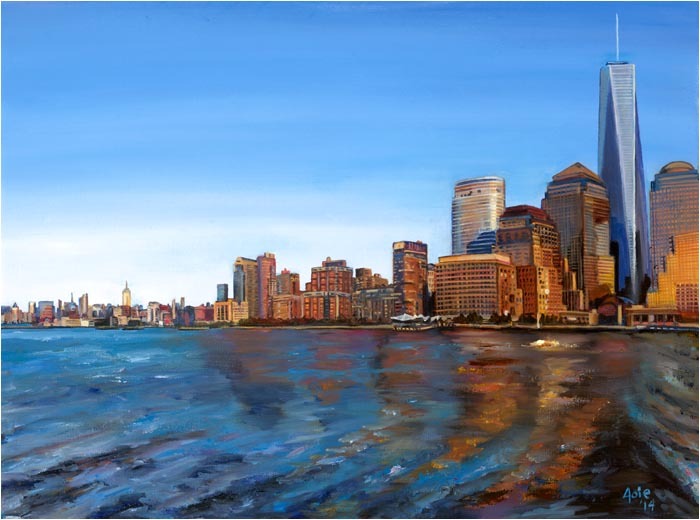 This painting is aptly titled "Freedom Tower". The scene is of the New York City harbor from the New Jersey side featuring 1 World Trade Center shining as stoic symbol of bravery and perseverance to all approaching her. I'm not really a religious person, but in some cases I do ask for a bit of divine assistance as want to do the best possible job I can to honor the subject matter; this was one of the cases. I so admire the tremendously talented architects involved with the creation of the 9/11 tribute buildings and memorials. Being at Ground Zero is truly a moving experience and like visiting Arlington National Cemetery, I feel something every American with the means to travel should visit in their lifetime and pay their respects to those who have served so greatly for our modern day freedom and simple daily luxuries.